When I was a child, I would often confuse clementines with tangerines and satsumas, and if I am honest I still do. Ultimately they are all types of mandarin. What I love about clementines though especially around the wintertime is they add colour to what can sometimes be a dreary time of year. I also like the fact they they make fantastic compact snack fruit, not like oranges that spurt their juices everywhere when you peel it and get your fingers all sticky. No clementines are a breeze and so easy to peel. I also love the scent of clementines. The smell of clementine is reputed to be therapeutic. According to some studies, the aroma triggers a neurotransmitter called serotonin in the brain. When the serotonin is released, the effect is one of calm and tranquil. There might be some truth in this, when I was a kiddie wink I would get travel sick and my mother would often give me an orange fruit. It could have been a mandarin, orange, tangerine, satsuma or clementine. I think it helped to some extent, as a distraction at least. My husband D is really poor at eating fruit. He enjoys his fruit, he's just lazy at eating it. So one of the ways I get him to eat his fruit is to disguise it. 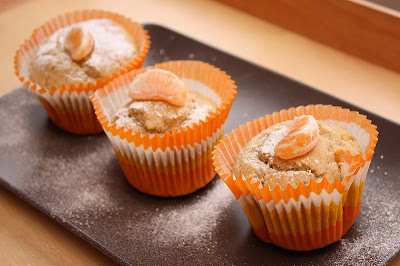 Only last month, I made some clementine curd, this time it was in this sweet homely bakes: clementine muffins. 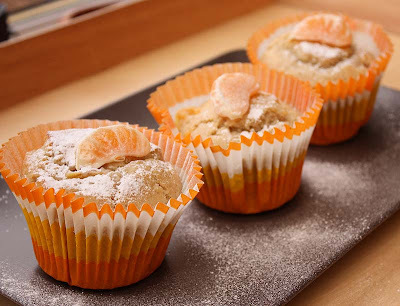 These Clementine muffins were ever so light and not overly citrusy. I think they are best eaten on the day, or warmed up briefly. The Clementine pieces had pretty much disintegrated into the muffins, this subtly flavoured the muffins along with the spices. If you like the look of these check out my marshmallow, cocoa and cola muffins. Preheat oven to gas mark 5. Line a muffin tine with muffin cases. Mix the flour, baking powder, salt, allspice, nutmeg and sugar in a large bowl. Rub in the margarine or butter until the mixture resembles fine breadcrumbs. In another bowl, mix together the egg and milk, then add this mixture all at once to the dry ingredients. Mix briefly until just combined then fold in the clementine pieces. 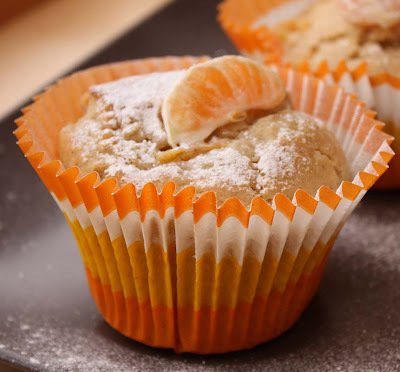 Spoon the batter into the prepared muffin cups, dividing it evenly. Bake for 20 – 25 minutes, or until risen and golden. Transfer to a wire rack and allow to cool before serving with an optional sprinkling of icing sugar. From Muffins Galore by Catherine Atkinson. I have a number of muffin books and recipes have been hit or miss, with this book though everyone so far has been success. I think this is one book I would recommend to fellow muffin lovers. These look lovely, another one to try. I love tht smell, and great idea to put them into muffins. It's breakfast time, can I have one please? It must have other therapeutic values too. Thanks you Nicisme. You would be more than welcome to have more than one if you wish! Sounds yummy I'll be sure to give it a go. Thank Kella. They were really 'refreshing'. I missed this post the first time around. I see you found some interesting muffin cases - they're great, so may I ask where did you get yours from? I found these in TKMaxx. D wasn't happy with me getting them as they cost £2.50 for 75. He's right normally you can get 100 for £1.50, but sometimes the consumer in me comes out.